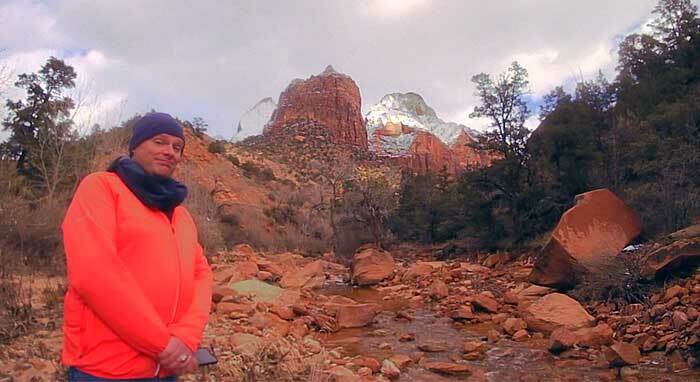 Zion is simply spectacular, whether you capture still image or shoot video on your cell phone. But there’s a lot more happening in the park, that simply can’t be captured in a frozen frame or a quick video. 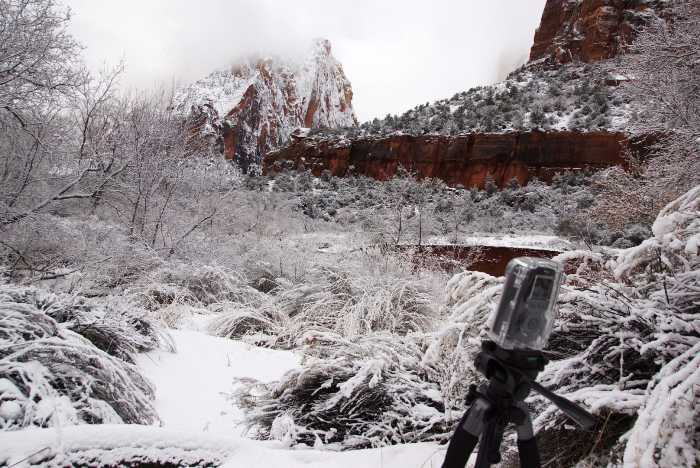 When I visited Zion in January 2017, I made it one of my goals to attempt some time-lapse photography. The results weren’t perfect (after all, time-lapse is tricky!) but I did manage to capture some of the park’s beauty that would otherwise go unseen. Okay, here’s the edited version of the time-lapse videos that I shot while in Zion. Now, here’s how I did it. Visiting the park in January provided me with an opportunity that doesn’t exist at other times in the year. January is Zion’s least-visited month, and if you avoid holidays like New Year’s Day and MLK Day, the park is downright empty. The lack of visitors made it less risky to set up my cameras and abandon them for a few hours, or an entire day. It was a risk, but I decided it was one worth taking. I tried to choose locations that were slightly off the beaten path — hopefully reducing the number of curious people who might walk by. Since there was snow on the ground, it was easy to figure out where people had been walking, and where they hadn’t, and then wander off the trail and find a spot. In some cases, I used a cheap tripod and packed the legs into the snow. In other cases (like the one in the photo at the top of the page), I used a flexible leg tripod to secure the camera to a log or a tree branch. The real trick was finding a spot that provided a good shot, while also being somewhat hidden, and also being extremely stable. Time-lapse cameras can’t move, even a little. They have to stand up to some wind and other vibrations (say, foot traffic on a bridge). As you’ll see in some of the clips in the video, the shots were a bit more wobbly than I would have liked. I used two kinds of Brinno time-lapse cameras to shoot the videos: a TLC-120 and a TLC-200 Pro. The 200 is one of my roof-mounted Drivelapse cameras that I took off the car and mounted to a tripod. As the “Pro” in the name suggests, it’s a solid camera that provides a lot of shooting options. The 120 (seen at the top of the page) is a much smaller camera, but it essentially does the same job — the main difference is that it has a built-in rechargeable battery, while the 200 takes AA’s. When the 200’s batteries go dead, you can swap them out, while recharging the 120 requires it be plugged in. Both of these cameras are specially made to shoot time-lapse. They don’t shoot regular video. Instead, you can set them to shoot in intervals – starting at a few frames a second. I shot at one frame every two seconds (I think), but I still needed to increase the speed during editing. For now, these Brinno cameras shoot a maximum of 720p, but it’s rumored that a 1080p version is coming soon, possibly in 2017. Oh, and did I mention that a time-lapse camera on a tripod is also a great selfie cam? I started and ended most of my videos with a selfie shot, although these were removed from the final video during editing. I’m still working on writing about the entire trip to Zion, but in the meantime, you can check out my 16 Reasons You’ve Got to Visit Zion in Winter. I wouldn’t want to leave cameras abandoned in Zion National Park during the busy summer season. I’m pretty sure they’d disappear by the time I returned. But in January, you have a great opportunity to capture soaring clouds and racing shadows in Zion Canyon, if you’re willing to take the time to time-lapse it.